As we were heading towards Bomdila, all of us started to feel the December cold creeping on our skin. We finally reached Bomdila the same night we set out from Guwahati just as planned but everyone was exhausted by this time so we decided to call it a day and made arrangements to stop over for the night in Bomdila. The next morning, we set out to complete the other leg of the journey to Tawang. I was particularly excited to reach the Sela pass as I have heard a great deal about it before embarking on this trip. When I finally reached the place the mountains and the deep ravines between them seemed to be bursting with joy. There was sigh of relief when the when the sun was high up so that its warmth cut through the chilly. Sela Pass also had calm and silent atmosphere to it, it was the kind of place where one can meditate endlessly if the strong chilly winds weren’t blowing about. I could just hear my heartbeat in the silence. The area was also decorated with Buddhist prayer flags, which covered in the snow was truly a sight I will cherish throughout my life. We finally went ahead and stopped by at Jaswant Garh, awar memorial to the great Indian Army soldier Jaswant Singh. Spending some time at the memorial and hearing the saga of Jaswant Singh’s bravery from the soldiers on duty there filled me with an immense sense of pride for my nation and the brave soldiers who risk their lives defending it. The soldiers on duty there also offered free refreshments to any fellow traveller who stopped by at the memorial, which we were happy to accept after journeying continuously throughout the day. We finally managed to reach Tawang by 7p.m. that day. Nestled between the majestic hills and alight in the dark, it was truly a sight to behold. The Next day we saw the Tawang Monastery, another place where you can be in solace and solitude. We also learned quite a bit about the local culture in the Monastery’s museum and clicked pictures with locals. We also went to Bumla pass, near the Indo-China border. With the clouds below us and the mountain peaks covered in snow, it felt like as if were taking a stroll through the skies. The lake were covered in ice and resembled an ice skating rink. My younger cousin sister tried her hand in making a snow man while me and my other cousins enjoyed a little snowball fight. Due to heavy snow fall and bad road ahead, we couldn’t go till the very hill top, but I didn’t leave the place with any regrets. In the evening, we came back to town and went for a little shopping spree. I bought some traditional items as a souvenir of this trip to take back home. How to reach tawang- Opt for a road trip, it’s Worth the time. Transport — hire an Innova car or sumo. Break your journey as the distance between Guwahati and Tawang is quite a bit. Arrive at Guwahati first and stay for a night at Bomdila. Always remember to have an inner land border permit ready at hand before leaving. Wow super exciting….. Sounds like adventures. ?? 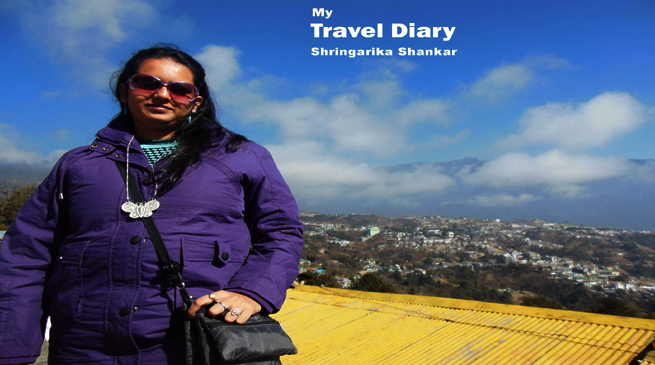 Tawang is a place i always wanted to visit, after reading this i have made this place my top priority in my list of places to travel. “I guess there is no as such substitute experience for traveling”. The article was very nice.I am also their that’s very lovely trip with all members. awesome article of an amazing trip….